How do you solve your blackhead woes and how do you prevent them from coming back? Having pores that are ‘not normal in size’ can be really challenging. Pores like mine tend to get clogged and invite dirt, forming more whiteheads or blackheads. 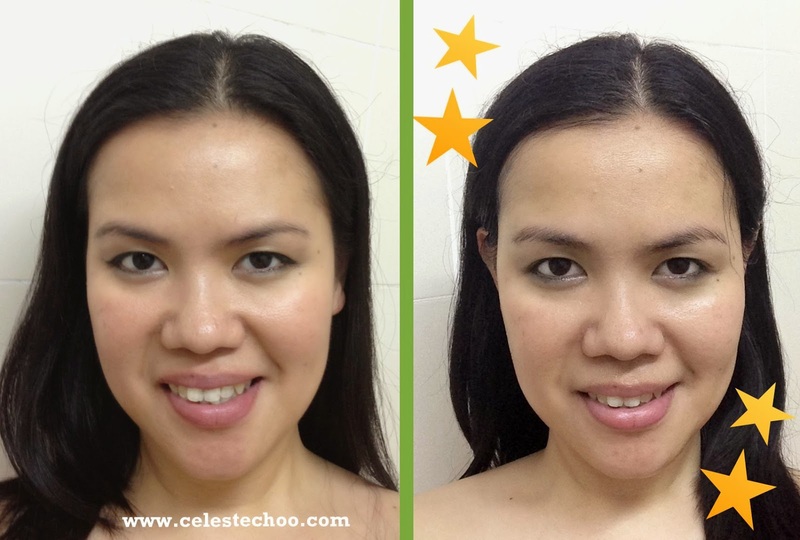 My regimen through the years involved proper cleansing and trying to ensure that I use the right cleansers to address this concern about blackheads. Although there are a lot of good cleansers out there, it pays to use a specific one that is targeted to fight those nasty little things. While doing my regular visit a few months ago at a leading pharmacy, I stumbled upon this product from Neutrogena, which caught my eye because of its name that twinkled magically to my attention (ching ching ching). Blackhead eliminating, eh? Gotta try that. This product comes in a half-transparent plastic tube. The flip-top cap makes it convenient, and the opening has a sticker seal for quality protection. You have to twist the cap open to remove this. The scrub itself is a shiny, white fluid with orange micro beads. It just smells clean and nice, no extra fragrance there. I love using this on my face. 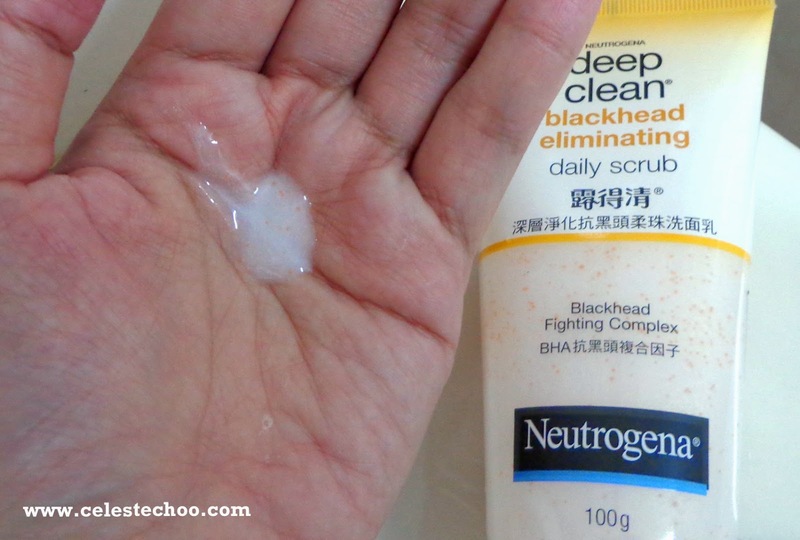 During the day, I normally use a different cleanser then in the evening, I use Neutrogena Deep Clean Blackhead Eliminating Daily Scrub after Cleansing Lotion. My face feels great and really ‘deeply cleaned’ with this scrub. What difference did it make on my pores? 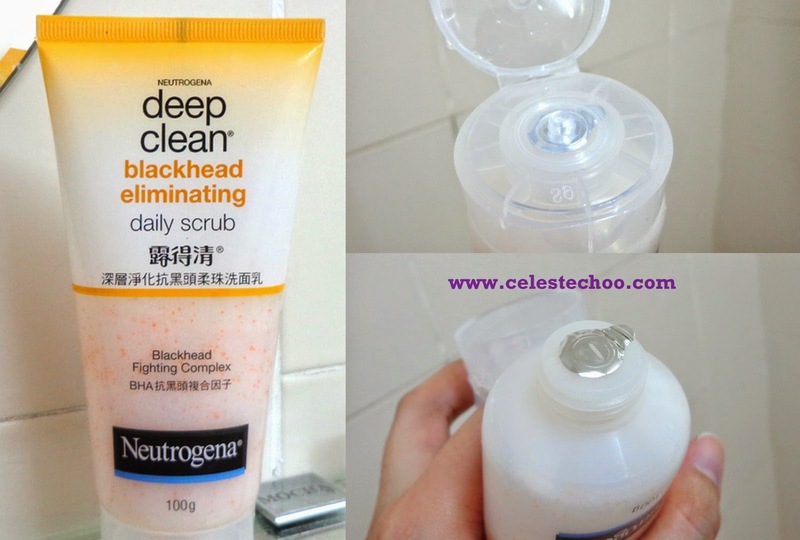 Neutrogena Deep Clean Blackhead Eliminating Daily Scrub is OIL-FREE and SOAP-FREE. As a daily cleanser, squeeze a pea-size amount of the Blackhead Eliminating Daily Scrub onto your palm. Add a little water to form a lather and gently massage over the face. Rinse thoroughly with lukewarm water. Can be used everyday. I might be a bit late in sharing this but we still have a few days! 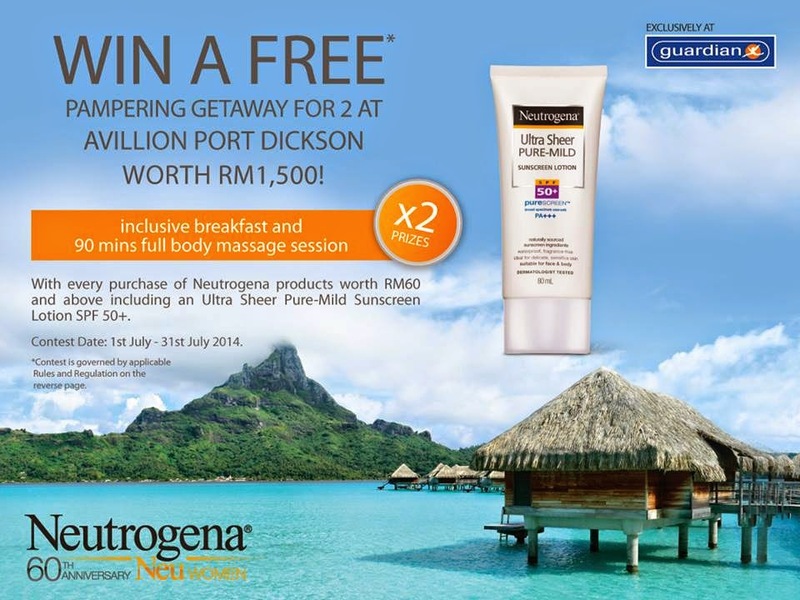 Neutrogena Malaysia is running a contest with Guardian where you and a friend can win a pampering getaway to Port Dickson! WIN a free pampering getaway for 2 worth RM1,500 when you purchase Neutrogena products (including NeutrogenaUltra Sheer Pure-Mild Sunscreen Lotion SPF50+/PA+++)! Visit the nearest Guardian Malaysia to get your entry form! 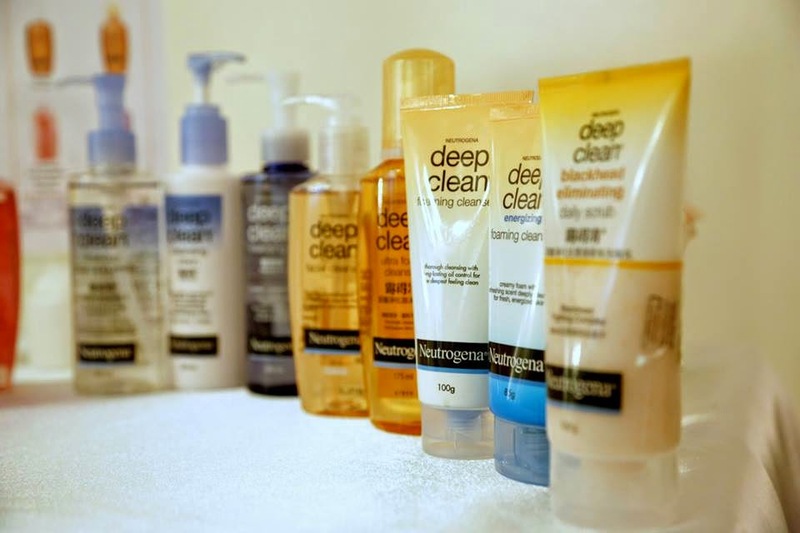 Discover more Deep Clean products from Neutrogena in leading pharmacies. Neutrogena the #1 Dermatologist Recommended skincare brand offers a wide range of skin care products. Neutrogena began its success story in 1930 when founder Emanuel Stolaroff started a small specialty cosmetic company called Natone. In the early years, Natone was a supplier to beauty salons usually associated with the glamour of the film industry. By the 1940's, Natone began manufacturing and distributing cosmetics for the retail market. In 1994, the respect and credibility earned by Neutrogena Corporation led to its acquisition by Johnson & Johnson in 1994. As a member of Johnson & Johnson companies, Neutrogena has the opportunity to preserve the "Neutrogenic way" while at the same time drawing on the breadth of Johnson & Johnson resources. Now, more than ever, consumers equate health with beauty. Neutrogena stands naturally poised for tremendous future growth and an ever-increasing number of satisfied customers. Under Neutrogena Brands.